Just 90 miles from Cuba, Cuban flavor is in the fibers of Key West, from cigars to cuisine. Cuban food in Key West is as much of a staple as its local seafood. Check out the best spots for Cuban fare in the Conch Republic, from your morning joe to Havana-style street food. Start your day with a taste of Cuba’s beloved export – coffee. The Cuban Coffee Queen is a coffee and sandwich stand located on the waters of the Key West Bight next to the 24 North Hotel shuttle stop. It’s simply the best place on the island for Cuban coffee. Order a café con leche (best served iced) or the “Bucci” - a strong Cuban espresso served with cane sugar. Don’t hesitate to order a breakfast sandwich to go with your coffee. The Key Westerner is their tastiest sandwich, made with two eggs, American cheese and your choice of meat on Cuban bread. Keeping with the theme, we suggest the chorizo. This is where the locals go. El Siboney is a no-frills diner located in an unassuming part of Old Town that’s mostly residential. The restaurant serves up generous portions of homestyle Cuban food, always accompanied by fresh Cuban bread. 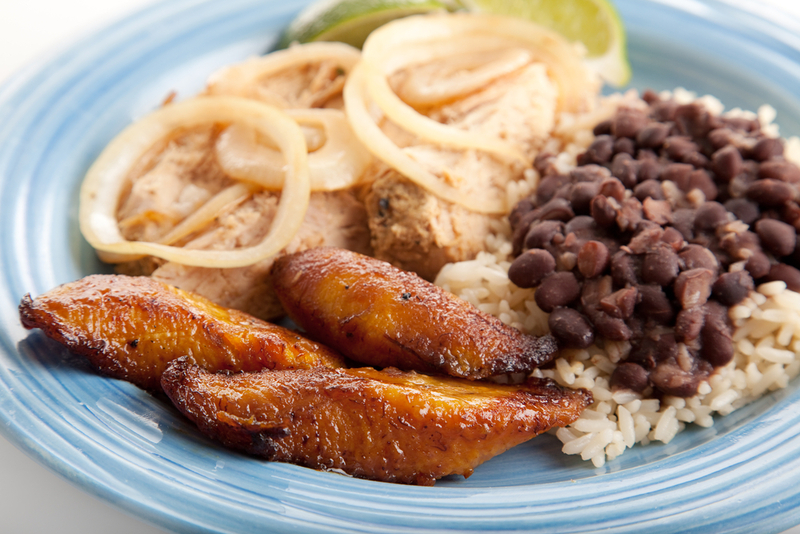 We recommend the roast pork, which comes with heaping portions of rice and sweet, fried plantains. Save room for dessert – guava cheesecake is on the menu. This may be the Cuban flavor you’re looking for. Set in Mallory Square, El Meson de Pepe has a wide variety of Cuban dishes, from picadillo (savory, well-seasoned ground beef) to rabirubia frita entera (whole-fried yellowtail fish). For tapas, we recommend the Cuban nachos, which are made with homemade plantain chips, ropa vieja, and picadillo, topped with guacamole and cheese. El Meson de Pepe in Mallory Square is a popular spot that’s efficiently managed; go around sunset to catch the salsa band play nightly latino rhythms on the outdoor patio. Located between Simonton and Whitehead streets in Old Town, Frita’s has become the top burger spot on the island in recent years. What this eclectic hole-in-the-wall lacks in space it makes up for in flavor. It serves “fritas” – a Cuban “street-food” burger made with pork and beef blend patties excellently seasoned, crispy potatoes and a secret sauce. Try the traditional frita, or opt for the “Frita Confundita,” which is topped with mojo pork. Hours: 11 am to 11 pm. Closed September. This longtime Key West counter-service spot recently moved to a new and more spacious location, but still offers the reliable island staples that made it famous – Cuban sandwiches and café con leche – until midnight. Aside from Cuban fare (we suggest the ropa vieja), Sandy’s serves American breakfast and Mexican tacos, all consistently good. Hours: Open daily 5 am to midnight; weekends 7 am to midnight. Hungry for an eclectic food scene? You won’t find anything like the local eats of Key West. Check out rates at 24 North Hotel.